In the UK, there is an estimated requirement for 250,000 new homes a year with a government desire to build high quality homes that will sustainably met the long-term needs of their occupants e.g. the elderly. The standard has been developed by BRE (who run BREEAM), to drive quality in the housing industry with a 5-star rating system that allows new homes to be quickly and easily compared. It enables house builders signed up to the scheme to demonstrate the quality of their homes with information on building quality, running costs (utilities, insurance and maintenance) and the positive benefits of a healthy home in a connected community. There are over 11,000 houses registered on the scheme with a mix of registrations from large housing developers, smaller independents and those registered where the HQM is aiding in the planning process. Independent, fully trained and licensed professionals assess and score a new home to give an overall 5-star rating. The wide range of issues that are measured are divided into three sections in HQM ONE: 'delivery', 'our surroundings' and 'my home'. These sections and the subsections within each of these totals for a possible 499 credits. ‘access and space’ account for 11 credits and ‘energy and forecast’ is the largest section at 60. The credits are totalled to get a five possible stars and also as indicator bands for the type of house a home owner is buying. Where do lifts fit into HQM ONE? The is no requirement for a lift within the scheme, however it falls under the 'access and space' sub-section 23 within the 'my home' section. The aim of this section is to 'provide an acceptable and effective internal space that is accessible to all and supports the function of the home' and clearly a home lift can play a pivotal role in this aim. This aim has been updated and relates to BS 7000-6:2005 Design Management Systems. Managing Inclusive Design. The updated section of '03 Accessible and Flexible Design' states in order to get the last six credits of the possible 11 within the access and space section of the home quality mark, the home must have an Access Consultant involved at RIBA Stages 2,3 & 4 and meet the requirements of the building regulations in Approved Document M - Access to and use of buildings Category 2 OR Approved Document M - Wheelchair user dwellings, where required by the local authority. A domestic lift (or home lift) can both ensure that provision of living spaces are comfortable and easy to navigate whilst providing the owner with peace of mind - in the knowledge that they will be able to enjoy their new home for years to come. Particularly with the prevalence for town houses a lift can be a useful addition, whether moving dinner plates from the kitchen to dining room, or people from the lounge downstairs to the master bedroom upstairs, creating lifetime homes. As a lift provider of both platform lifts and service lifts, amongst others, here at Stannah we are increasingly seeing those involved in construction of new homes add in platform lifts or dumbwaiters as part of the trend for highly specified luxury housing. The rise in popularity of the HQM for both construction professionals and home owners means this trend in domestic lifts will continue to increase. The next version; Home Quality Mark ONE, replaces the 2015 Beta version and is currently in technical consultation (closing the 9th February 2018). The continued development of the Home Quality Mark scheme supports the culture change required in taking greater responsibility for the performance of homes that are built. Since the launch of Beta they've engaged with many different HQM stakeholders, including developers, assessors, consultancies designers, consumer groups, representative industry bodies, manufacturers, academics, regulators, planners, agents and various parts of the financial sector. The list of these already signed up for the scheme includes well-recognised architectural practices, house builders and construction companies, including Bouyges, Mace, Miller Homes, Hilsdon Homes, AECOM, etc., a full list of people signed up to the HQM can be found here. The HQM ONE Consultation comes at a time when there is an increased focus on quality for new build homes, most recently the Independent Review of Building Regulations and Fire Safety by Dame Judith Hackitt and is likely to continue to evolve in light of any changes. Builders, Developers and Architects involved in the construction of homes are increasingly adopting this system to show they have the best homes. One would anticipate in a way similar to the BREEAM adoption, with new homes developments and residential developments differentiating themselves by being highly star rated. Considering building to the Home Quality Mark standards? Then simply click to the page dedicated to helping developers, members of industry and housing landlords - discover more about HQM and why to use it. HQM certification provides a mechanism that recognises those developers who are already taking responsibility with regards to quality home building and encourages others to enhance their service. A home with a lift really does stand out from the crowd, propelling a property into a highly desirable ‘must have’ category, plus it could help to get that all important 5 star rating from the Home Quality Mark. Of course, it's not just people-moving lifts that have a role in domestic living. As the trend for townhouses continue, service lifts (also known as dumbwaiters), are having a resurgence in popularity. 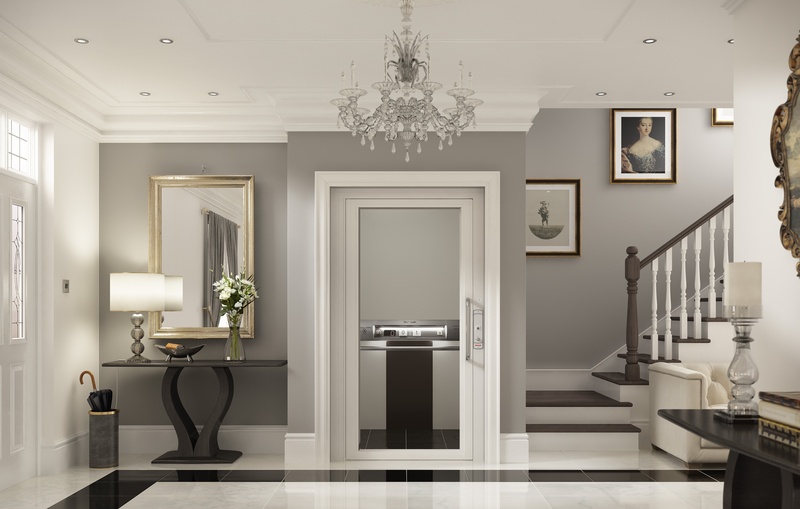 Here at Stannah, we are increasingly see luxury home developers add a lift as part of their specification. If you're considering home lifts for your project please get in contact, we're certain we can help!